CAUTION: Risk of product damage. This product contains sensitive electronic components. Use care not to damage pins and connectors during troubleshooting. The handle must be in the open position for the touchless sensor to operate. Verify that the handle is in the open position before using the faucet. If the touchless function will not activate, the faucet may be in the manual sensor override mode, which allows the touchless faucet to function like a regular faucet during a loss of power. Refer to Overriding the Sensor on Touchless Faucets for further information. A switched outlet is a power outlet that only operates when a light switch is turned on. If the faucet only works when the garbage disposal is running, it is connected to a switched outlet. If using an AC Power Adapter, verify that is it not connected to a switched outlet (typically used for garbage disposals). If a regular non-switched outlet is not available, the faucet may be able to run from batteries (Malleco® and Barossa® only). 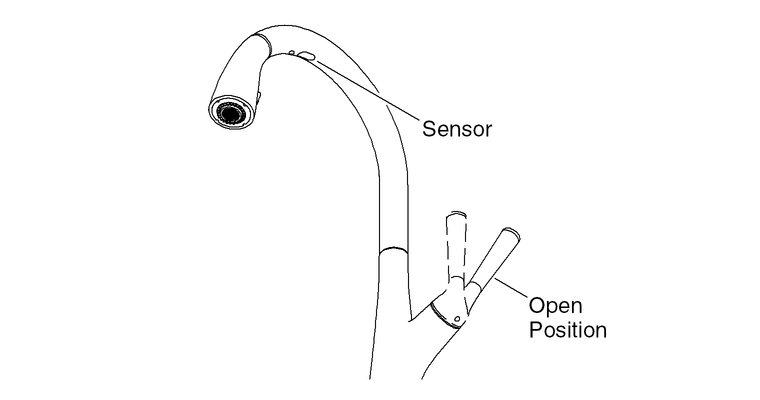 Use mild soap and water to gently remove debris from the sensor lens located underneath the arch of the spout. Rotate the spout away from the steam. If using an AC power adapter, verify that it is not connected to a switched outlet (typically used for garbage disposals). If a regular non-switched outlet is not available, the faucet may be able to run from batteries. For the Malleco or Barossa Touchless Kitchen Faucets, a red flashing sensor light indicates low batteries. Replace the batteries if the sensor light is flashing red.